^ BirdLife International. 2015. 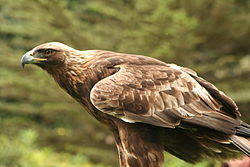 Aquila chrysaetos. The IUCN Red List of Threatened Species 2015: e.T22696060A80364370. https://doi.org/10.2305/IUCN.UK.2015-4.RLTS.T22696060A80364370.en. Downloaded on 17 December 2015. ^ Clements, J.F. ; et al. "Clements checklist of birds of the world: v2015 (Excel spreadsheet). (Retrieved 17 December 2015). ^ Soma, Takuya. 2012. ‘The Art of Horse-Riding Falconry by Altai-Kazakh Falconers’. In HERITAGE 2012 (vol.2) - Proceedings of the 3rd International Conference on Heritage and Sustainable Development, edited by Rogério Amoêda, Sérgio Lira, & Cristina Pinheiro, 1499-1506. Porto (Portugal): Green Line Institute for Sustainable Development <E-Book ISBN 978-989-95671-8-4>. ^ 相馬拓也2013「アルタイ=カザフ鷹匠たちの狩猟誌: モンゴル西部サグサイ村における騎馬鷹狩猟の実践と技法の現在」『ヒトと動物の関係学会誌（vol.35）』: pp. 58–66. 2013.